A lot changes when the universe gets reset twice. As the rest of the team is trapped by Dark Lord Opal, Impulse and Superboy were reunited. However, a little stubble pointed out by Bart isn’t the only change that Connor has undergone. Not only is he hiding out on Gemworld, he has a wife and child. Now, the family he has built is threatened by the guards that tracked down Impulse straight to Superboy’s front door. Inside the prison, the heroes there try to devise a way out. Amethyst reveals to them that she is originally from Earth and is being held captive as a political prisoner for trying to speak out against Dark Lord Opal. We then see a flashback of her preventing an assassination that she blamed Opal for. She then pleads with the counsel of Gemworld to take permanent steps to neutralizing him, but they refuse, threatening to kick her off the counsel. In the present, Superboy is trying to defuse the situation at his farm, while Bart continues to irritate the guards. When the leader of the men becomes fed up, he tries to attack Conner, giving Superboy the chance to fight back. He shatters the guard’s armor with one hit, sending the others away in a panic. They enter Connor’s home, but when Bart tells him that Young Justice is back together, they immediately head out to find their friends. At the prison, Jinny tells Robin that they need to get out of there as soon as possible. In the back of her pickup truck, there is a chest full of powerful artifacts from her great-great grandfather, Jonah Hex. If any of them were to get out of the box, they would cause a lot of damage. At that exact moment, one of the guards opens the box, unleashing…well..I’m not quite sure what it was. As the heroes try to figure out what’s going on, Superboy and Impulse arrive and break them out. The core four (Robin, Impulse, Superboy and Wonder Girl) are finally reunited. As the three new heroes join them, they discuss their next move. Superboy tells them that the first thing they need to do is get away from the prison as fast as possible. When Teen Lantern asks why they were attack upon arrival, Amethyst tells them that they’re seen as a threat, and whatever Superboy may have heard about Opal, it’s much worse. We then flash back to Amethyst speaking with Lady Turquoise about how to handle Opal. Before they can set up a plan, the castle they are in starts to rubble and energy begins to crackle around them. As the castle begins to crumble, Amethyst moves inside the wreckage and finds Robin inside. The team is finally back together. Now that the core four are back in the same place, Young Justice can finally get back in full swing. My question for Superboy is, now that he has a family, can he still be a superhero like the old days? And how will Cassie feel about her ex having a wife and kid? However, right now, all they need to be worried about is getting off of Gemworld and preventing another impending attack on Earth. With the last four issues acting as the series set-up, it’s time to kick things up a notch. 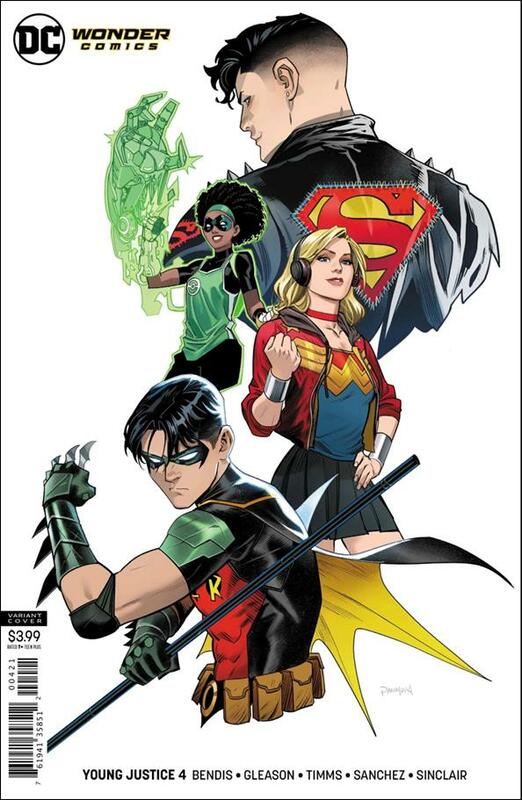 Now, finally, I think we can truly say that Young Justice is back.